I am not sure what has been wrong with my technique of growing chillies in the last two years. I suspect they might have taken objection to my reluctance feeding them. Anyway, come September they were, and are - this year even worse - just about to flower for the first time if at all. Won't bear much of a crop. 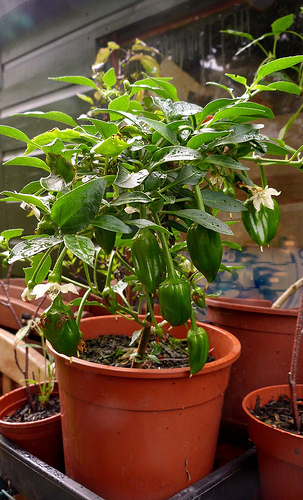 Except last year I discovered chillies are tender perennials. So I took 3 pots in over winter and kept them on the kitchen windowsill. They kept flowering and produced the odd tiny chilli. The only problem was greenfly, which affected them all winter. At some stage I also petted a ladybird, that I found on the window, to try and get rid of them. But then it was summer and I put them outside again. Here is one. 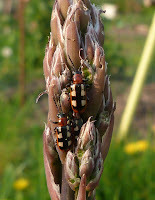 It looks like I will get my crop from them rather than the new plants this year. 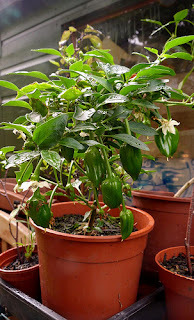 So if you have not been very lucky with your chilli plants, don't give up. They might do better next year, given a bit of TLC over winter. I have not written for a while: gardening is repetitive, so I sort of ran out of topics, and I am trying to figure out how to make my pages interesting in the little time I have. Also, I am not happy with pictures from my new camera, so my old blog format does not work any longer. That does not mean that I have not carried on in my garden and in the kitchen finding the best ways to use my produce. Elderberry had a special place this year too. I made Holunderlikoer, which I love, and jam (but it set too hard so it rolls rather than spreading). Then my friend wrote to me saying she had found out elderberries had medicinal properties, could I sent her something. I researched it a bit on the web and found it is good for winter colds and coughs, and what I was after was a "rob" - which, I found out today, stands for thickened juice). Could not find a definitive recipe, but storage over time seemed an issue with some of them. So I made up my own recipe with info from here and there. With a fork, pull the berries from the stalks, removing as many of the remaining stalks as possible. Wash.
Simmer the berries until soft and squash them with a food mill to get the juice (without seeds, as they are mildly toxic). Mix with the sugar and bring to the boil, adding the spices. Thicken it to a runny honey texture. Bottle as jam. 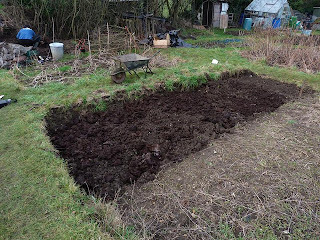 I have started clearing the wilderness that both my plot and hubby's had become, the endless rainshowers having not so much made the soil muddy as workable again -especially the new bit, which was compacted and very much like concrete under the spade. I will take sone pics over the weekend, as it is starting to look good again. And there is a lot going on, despite the indefatigable chomping of slugs and snails (I must be sowing at a rate of three times as much as I get). At the moment, my favourite crop is redcurrant: the red berries look like jewels dangling from among the lush green leaves, and are delicious straight off the plant when properly ripe. But some ofthe salad colours are equally spectacular, the one I like most having light green leaves with curly edges in purply red. This year I have lost my gooseberries to pigeons once again. It happened in the first year when I did not know what that bush was. Then I netted it the second and third years, and had bumper crops. This year, despite the netting, they were gone and I was left with only 2 punnets, when only last week I could see plump, almost ripe berries on all branches... which I did not have time to pick. Yes, I think it was a matter of timing. Once the berries were ripe, pigeons found ways to get at them - even though they are green and barely visible. They throw themselves on the netting, bend or break the branches, and eat all they can. The rotters. Anyway, two punnets I got, and there might be some red berries on the newly planted bushes, the ones I hope will start cropping seriously from next year, their third. You really have to like gooseberries, because picking them is not for the faint-hearted. Today my arms look like I had a fight with a rather aggressive cat. It did not help that to avoid a thorn, I ended up with my hand in a clump of nettles! The British seem to like them better cooked, in crumbles, fools etc. I like them raw (and so do all my Italian friends that have heard of them). When they get soft, and from clear go cloudy, having lost the worst of their acidic edge, gooseberries have a mild yet delicious aftertaste that is difficult to describe. I have some with me for lunch today! ... so this morning, when I found myself awake in bed at 5 AM, thinking of the plumber and work, I decided I would get up for a change and go to the allotment to relax. And so I did. Rather strange for someone who, like myself, is definitely not a morning person, I thought the sunshine out of the window warranted a go at sunrise gardening. The three hours I spent weeding before breakfast were very productive (true in Italy there's a saying that goes "Morning comes with gold in its mouth"), and I got home with a good crop to boot! Still picking the come-again salad, while the second sowing slowly grows. 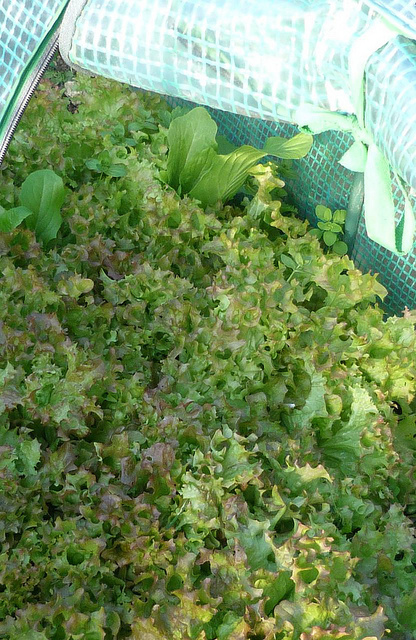 Salad is really a worthwhile crop, has saved me good money this year, so I took advantage of the current Thompson & Morgan 3 for 2 offer on salad seeds, and also bought some corn salad from Seeds Of Italy, which should crop late in the year. Now though - slight drawback - it will have to be bedtime already. I arrived at the plot a bit earlier than usual, between 19.15 and 19.30 and it was quiet. Soil was ok and I managed to do some digging while having some banter with the neighbours. All good, except that suddenly I could not hear them any longer and I realised when I came back from wherever I was, just before falling face forward, that I had almost passed out. Ok, I am quite tired, I know, maybe low blood pressure. But then I understood why it felt so quite: no bumblebees whatsoever - none on the phacelia, nor on the sage and not even on the borage that has started flowering. Quiet as death: it was horrible. I love insects, alive, going about their business and keeping me company. No idea where they all were. While wondering about bees, my eye fell on the garlic: it had died back. So I had a look: most of it had not even grown,. 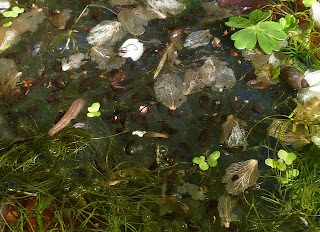 and all was rotting in the ground. I planted three times more than last year just to be on the safe side, and my crop might turn out to be ZILCH. I'll try and dry up whatever is left and see how it fares, but I'm not too hopeful. Not the best of evenings. I thought my ROI is very low, would I ever be able to make a living out of my gardening? If anyone ever tells me that - having gardened for a few years - they are an expert, I will laugh out loud.... How long does it take to learn? Mr Tod was running after crows on the football pitch outside the alltoment. 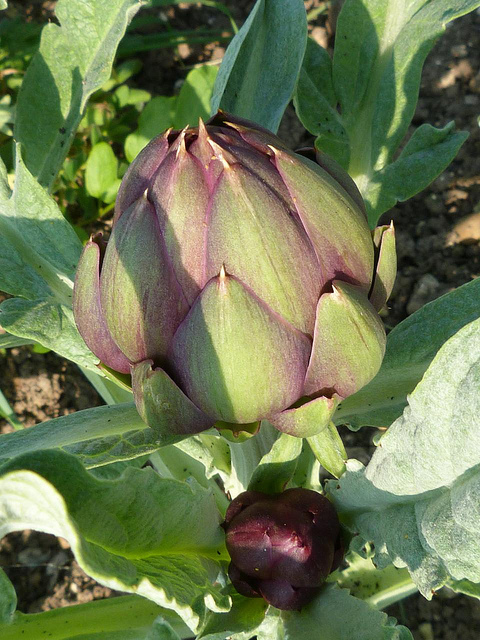 Sowed more potatoes and discovered than more artichokes than expected have made it through the winter, even if quite battered: what a surprise! 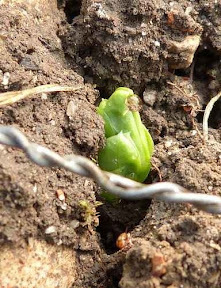 The cardoon is also resurrecting from its ashes - so to speak - and the first of hubby's peas are emerging with strenght. The water taps have been opened, and just as well, because we are going through a dry spell, and both of my waterbutts are empty. 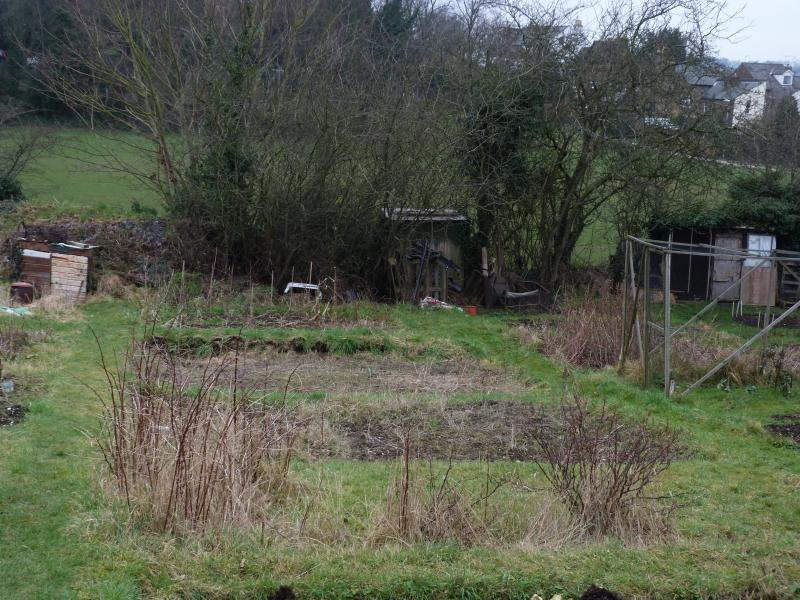 The plots looks nice and tidy and this is the week I can start my evening gardening: hurray! 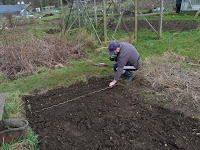 For the first time in four years at the allotment I do not feel like I am behind schedule sowing and planting. My early potatoes are already in the ground and sweet peas have germinated. Which does not mean I haven't got a lot to do, but there is no anxiety, which feels good. The hubby's terraced garden has dried up a little bit too much over the last week, but I watered it yesterday and have finished flattening the area where the new bench will go. Something that is bugging me, though, is the rats. I mentioned already that I did not catch any last time, but I found no cheese and a few little droppings in the cage. Well, this week I caught two little rats - as usual they came in pairs. No need to drown them, as they were already dead. And spookily something there was no trace of had eaten their snouts away: only the bones on two furry balls and tails were left. Finally, we got a proper sunny day, it was actually just the afternoon, but it was proper sunny sun! The springlike weather shouted spring-cleaning, and since the shed, plot and greenhouse are already ship-shape I tackled the hollies on the bank, cutting them back considerably: I love how it feels airy now! Then I started on old saved seed, and a pleasant, almost emotional journey in time it was, to when I first came to the UK and had a garden to care for for the first time. It was a beautiful, mature garden, and inspired me to learn more about the plants in it. The collector I am, I looked for ways to reproduce them to take with me, through cuttings and self-seeded seedlings - which I religiously potted on - and saving seed. How fascinating to go through the brown envelopes, labelled and dated - mostly 2006. Somehow I had forgotten about them at the back of the shed, but most seed looked in good condition, so I sowed them: lavender, geranium, Oenothera, hellebores, some wild flowers I never identified but were probably of the Malvaceae family. 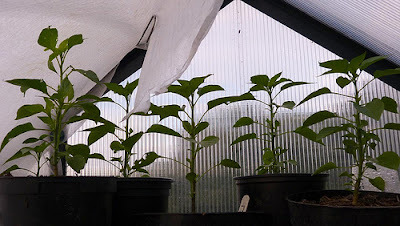 In the greenhouse, I went on sowing: tomatoes, aubergines, Lathyrus latifolius. And was extremely pleased to see that my vine cutting took and now has a huge, downy bud sticking out. I followed a method I read in a library book: cutting 10 cm in all around a good bud, then with a sharp knife slicing the twing lengthwise in half under the bud, laying the cutting - bud up -in compost & sealing in a plastic bag (*). We also went on working on hubby's terrace garden, and he helped me clear away another two bags of rubbish. We got a compost bin, and a bench to come shortly, for summer picnics. 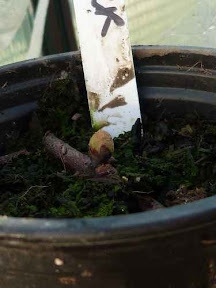 * the bud never burst open, but I found out that it is easy enough to propagate vine cuttings just the "ordinary" way, by sticking them in a pot, no fuss added. At the end of this weekend we are both knackered, hubby and myself... maybe we overdid it this time. Today it was sort of sunny so we went on the mission impossible of putting the chitted potatoes in the ground. 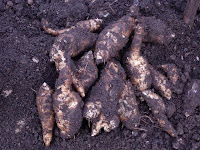 Hubby's soil is really heavy, though, so we ended up digging ust enough for one of the four bags potato seed I got this year. 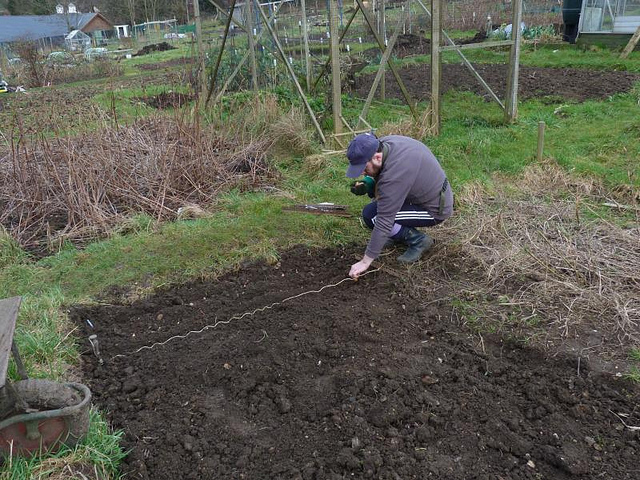 However, we did sow some peas. Will they have a chance? For the first time in the last four years there has been something digging out my broadbeans to eat the seed, while leaving the emerging stem there. Mice? The rat trap left me wondering with its mystery: the cage was where I had left it, closed, but the butter and cheese rind in the tub inside were gone, tiny droppings in their place. Happened to Paul the neighbour a few plots down. If they are mice, they must be really tiny. What else could it be though? The grounds were all abuzz this weekend, with nothing less than a huge bumblebee, drowsily scouting around the greenhouse, in addition to bit-more-lively ladybirds and, of course, people. Was good to have a few chats with old acquaintances. 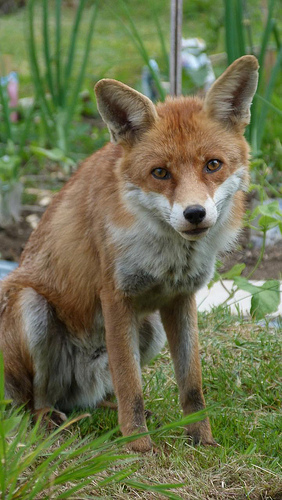 Also, I have a new neighbour, Louis, whom I have seen every time I was there - makes a nice change from not having seen anyone on that plot for four years! He seems rather nice too, even apologized for the bonfire he was making, a gesture I really appreciated. Down at hubby's plot I also met another Tony, with Cath, new tenants, but still no sign of the direct neighbours on one side. The terraced garden, previously planted with daffodils, was sown with wildflowers cowslips, harebell, Oenothera, Meconopsis Cambrica - might take a while to see results, though, as they are mostly biennials, but more flowers are on their way, as I was tempted by an offer of 150 freesias (bulbs or corms?) at Sarah Raven's last month. To end the day, I could not believe my greenhouse door lost a bolt (the other one, not the one that I found recently), so it's wobbly again... argh! I must say that the tinsely bit of sun we got today made a huge difference to my gardening motivation. 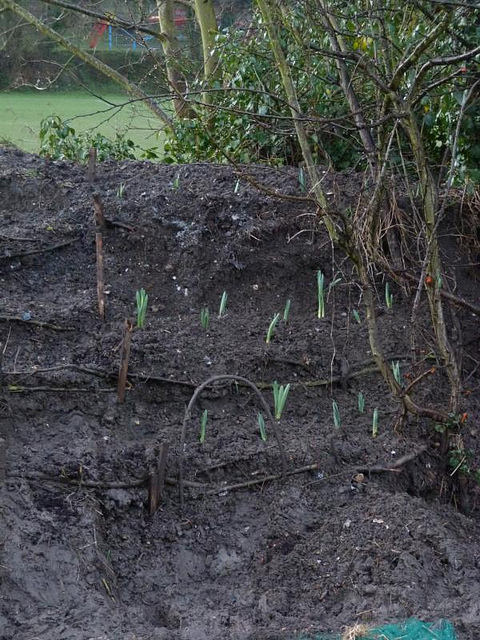 And so did going to the allotment with my husband: it's a nice feeling looking up and see that he is digging. I have unearthed another ten or so paint cans and tubs and cut back some of the sloes in the process. Hubby suggest that we put a bench down there, as it's the sunniest place we have on the plots. So I thought it would be nice to terrace the soil behind and around the bench and plant it with flowers. There's an awful lot to do, and it's better taken in chunks, so that we figure out what would come out best. So I left it, and went to clear my pond from a heavy blanket of couch grass that had covered it completely. 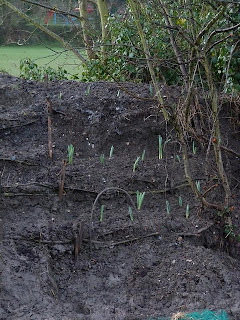 I am gradually also clearing all the beds from weeds: about time, as the bulbs are already pushing through and there's a risk of damaging them. And I got an amazing amount of sizeable Jerusalem artichokes from only one plant: I really like them, and the fact they are the only veg I have managed so far to grow in winter, alongside leeks: will put down more next year. 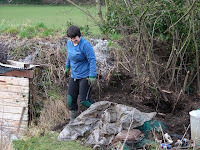 Unfortunately my complacency with rats over the last summer has bitten back: a huge mound of crumbly soil under the derelict shed of the previous owner (which I still haven't pulled down and transformed in a compost heap - is sure sign of them burrowing in. Luckily I had some pellets with me, which I scattered in the hope they will eat and die. Unfortunately I forgot the butter to load the trap, but next time I will go armed with that too! After 8 months in the waiting list, and an incredible series of defections (there were 5 plots to choose from), we've got a small addition to our growing space. 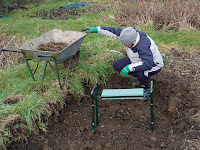 Hubby got wellies and gloves, and a kneeler pad (he is still in need of a tetanus jab, though), and today we went down to clear up and take some pictures. The plot is on the other side of mine - on the sunny side at the bottom of the hill - so the microclimate is bound to be different. For example my soil was frozen in places today, while hubby's was all right. We do not know how the soil was kept, so I was thinking a good round of weeding and feeding with seaweed might be appropriate. Gianfry dug clean a good three square metres: not bad at all for his first time. 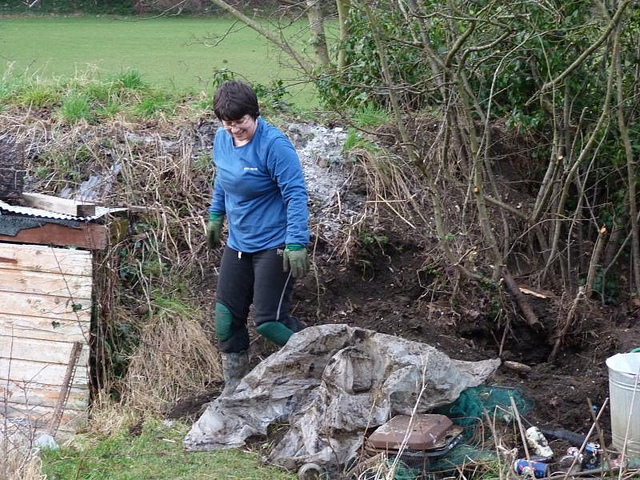 The neighbour, Sarah, was very nice and she said she will remove things that are in the way, like her compost heap. 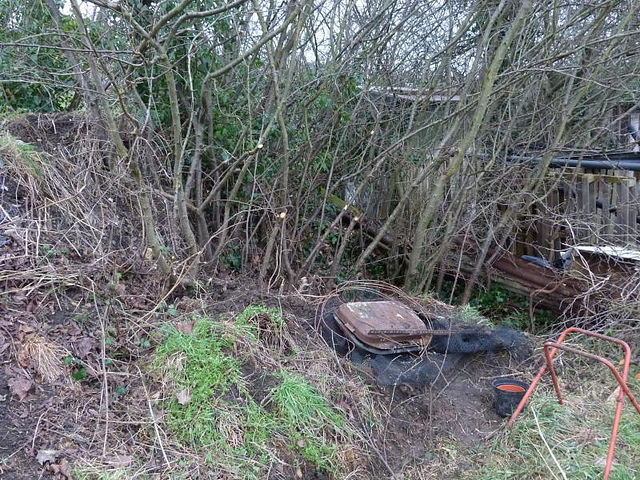 Unfortunately, the previous owner chucked cans of paint and other chemicals in the little grove at the bottom of the plot. I have removed at least five cans today: such a shame! 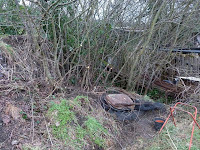 We will have to clear it well, chopping some of the self-seeded sloes back, and then I guess plant flowers and leave it as a haven for wildlife: I would not trust it for growing food. However, the grove might be a good place to plant my hops, if they do come out once I sow them: not sure why I suddenly fancied trying hops, but I bought a packet of seeds. There is quite a lot to do, even though the plot looks in much better state than mine did when I got it. On my side of the allotment, in the meantime, the garlic is already 10 cm out: let's hope we do not get a major freezing spell in February. Yesterday I ran through the allotment pictures from 2009, a selection of which I published on Flickr. I was really surprised by how much was there: I had forgotten almost entirely the amount of work I put into it, how much I had transformed the plot, and the fairly plentiful crops, the bugs, the colours... it felt strange, as I was studying throughout for my final exam of the BA, and I seem to have accomplished more than last year, when I had all my time for the plot! 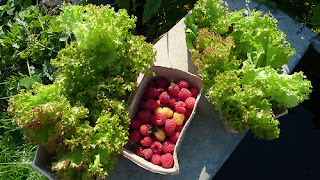 I had a lot of strawberries in 2009 that never returned in 2010, but much fewer raspberries. My tomatoes did get red, back then, although most went down with blight, while last year I had plenty of green tomatoes to make into jam (which is nice, and my auntie liked a lot!) and sliced in oil (though potentially very good, they came out too salty for my taste). I attempted carrots and "cime di rapa", although my results with brassicas have been rather awful both years. 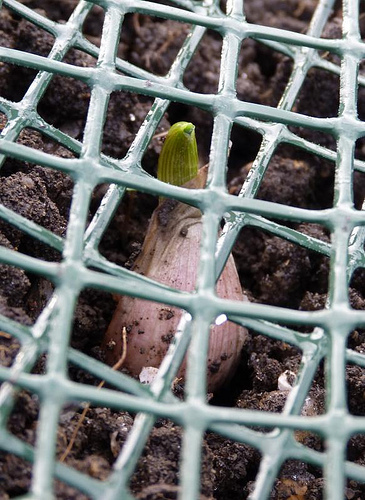 I finally managed to sow my broadbeans today... and it rained straight afterwards: that's good!